I am a recovering soup-aholic. Don’t get me wrong. I still love soup, enjoy soup, even crave soup. But there was a point in my life when all I wanted every day, all day, was soup. This was in the days before I spent quite so much time in the kitchen, so most of the soup I consumed during that period of my life was bought. Here’s the funny thing about store bought soup, though. You can order something very benign sounding, such as “vegetable soup” or “broccoli soup” and instead of a healthy dish, you just inadvertently consumed half of your daily allotment of calories. If I had tasted this soup in a restaurant or any other food establishment, I would have been wracked with guilt, convinced that there was more cream in the soup than anything else. The great thing about making things yourself, is that you get the low-down on what’s really in it. (Well, that might not be the best in something like a triple chocolate fudge brownies, but you know what I mean.) And this soup? Well it’s not just devoid of cream, not just low in calories, but it is absolutely and amazingly delicious. If there is anything better than coming home to a hot bowl of soup after a rediculously long day in the frigid cold of New York City, I haven’t encountered it. This soup is comfort food in the best way possible. Plus, it is souper easy to make. (Ahh! Excuse the pun. I simply couldn’t help myself!) The secret ingredient: beans. Interesting, I know. But the texture the beans give this soup is astonishing. Really, I have only one complaint about this recipe: it didn’t make enough! Preheat oven to 350. Line baking tray with parchment paper. Cut peppers in half and remove stems and seeds. Place on baking tray. Slice garlic thinly and spread over peppers. Sprinkle with 2 Tablespoons (half) of the oil, salt and black pepper. 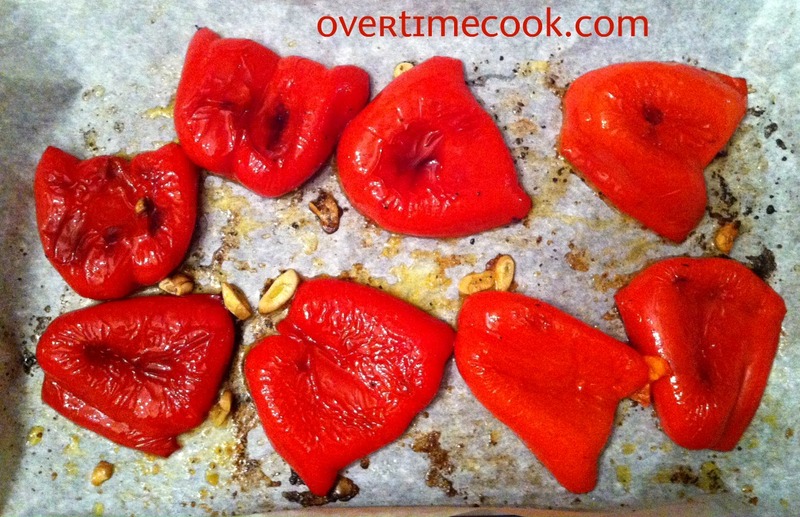 Place in oven and bake at 350 for approximately 40 minutes, until peppers are starting to brown. Remove from oven and let cool. Make sure to save all of the contents of the tray (including the bit of oil) as it has a lot of flavor. (This part can be done in advance.) Cut peppers into large cubes. Meanwhile, sautee onions in remaining 2 Tablespoons of olive oil until soft. Add diced roasted peppers, sliced roasted garlic and any drippings from the pan. Sautee an additional five minutes, or until soft. Add beans and broth and bring to a slow boil. 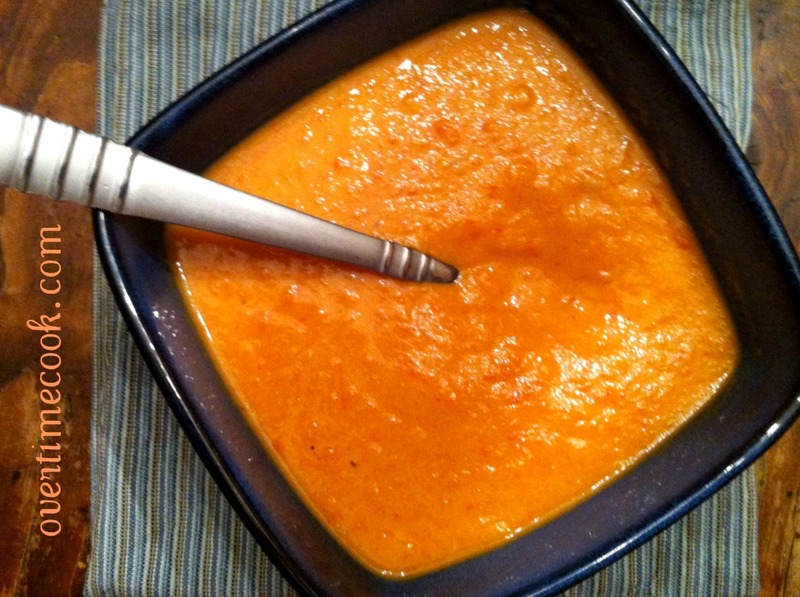 Using an immersion blender, or in small batches using a regular blender, puree the soup until creamy. If desired, add a bit of water to thin the soup. Serve warm, preferably on a cold winter night, and do I even have to say it? Enjoy! I agree it is great to know what’s going into your food (even those guilty pleasures when I pretend they arn’t really that bad). Great looking soup. Looks delicious!!!! Can’t wait to try it! i am a not-yet-recovering soup-aholic. i cant get enough, but i make all of mine, and no guilt, because vegetable broth has all the nutrients, and its mostly water…. yummy 🙂 this is my next soup project. but i’m not a fan of beans so i might try eggplant instead of the beans. Wow, love the idea to add the beans. The canned white beans I buy here in Israel come in tomato sauce. Sometimes I drain/wash, but in this soup I think it’d be a welcome addition. Totally making this. I can understand why you were wishing for more, though. 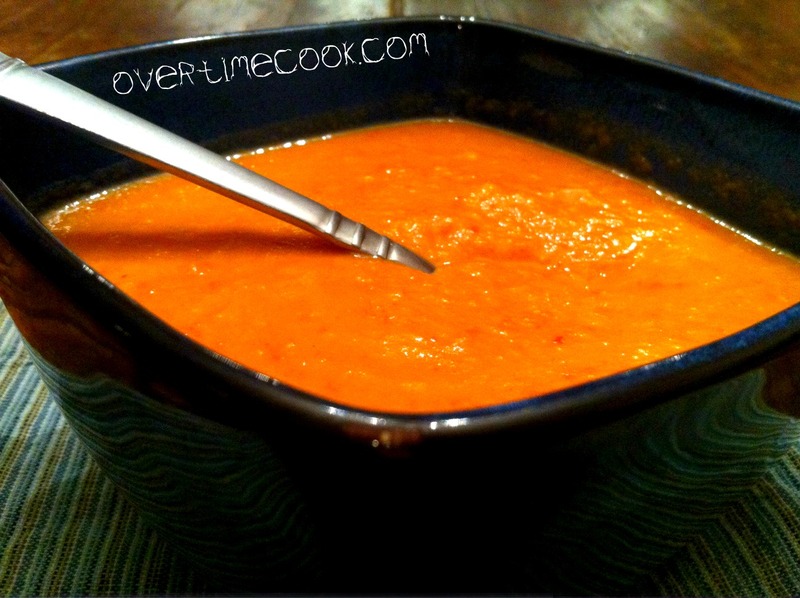 Another red pepper soup recipe I’ve been eyeing calls for 8 peppers! I agree, nothing more inviting than a bowl of soup on a cold day, even in L.A. Looks great! That looks really good! Think I’ll try it this weekend, perfect for a cold winter day! Sounds delicious. By the way…..you are so right about the soups you buy and the ones in a restaurant. Forget about the calories for a moment. As well, you get MORE than your daily allotment of sodium. Most store bought, canned, and restaurant soups have way too much salt in them. I am very salt sensitive and like to make the soups so I know exactly how much salt went in. Any substitute for the broth? Anything to replace the beans like can I use great norther or navy? I find it so hard to find white kidney. You can actually use a potato instead of the beans. According to Google, cannellini beans ARE navy beans. Again today it was yum!! I find the idea of beans more nutritious because of the added bonus of protein! This soup was a major hit! Deep, flavorful taste, but not heavy or spicy. It was delicious and made the whole house smell great! Delicious soup and easy too! Made it 2 times and was a hit! Very easy too for someone who was intimidated to make soup.. I had to substitute butter beans for camellia beans one of the times because couldnt find but worked well!